These Picture Frames Protrude A Mere 1.5" From The Wall! 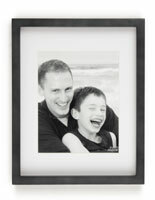 These Picture Frames Create A Visual Display That Will Get Noticed! This 1/2" wide satin gold aluminum picture frame includes a 1" wide black matboard with a beveled edge and a clear acrylic lens to protect your poster. Posters or artwork up to 3/16" thick can be located in this swinging picture frame and are supported by the white duraplast backboard. The outside dimensions are 26.5"w x 38.5"h and the observable area is 23.375"w x 35.375"h. The sleek design permits the front of this swinging picture frame to sit only 1.5" from the wall. Mounting hardware and instructions are provided. For proper operation a 1.75" area is needed on the left side of the frame. Click here to view how to mount this frame. 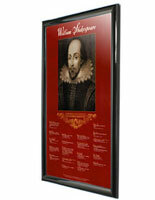 Exchange your 24"w x 36"h posters monthly, weekly or even daily in under a minute with this amazing picture frame. This solid frame has concealed hinges that enable the frame to swing totally open giving you entrance to your advertising prints. 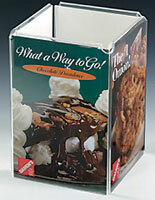 Changing posters is fast and easy with the removable/reusable mounting tabs that are provided with every frame. The uncomplicated and useful gravity latch system keeps the frame closed and is concealed out of view.